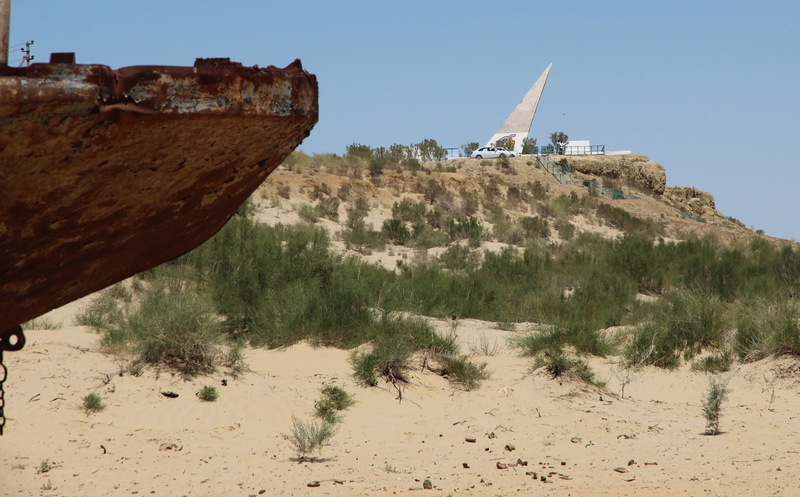 Ghost ships in the desert—the heartbreak of the Aral Sea | Where to next? The Aral Sea appears frequently as an answer to clues in crossword puzzles. Sadly it barely makes a showing in real life. Once the fourth largest sea in the world, the Aral hardly exists today. Its loss is often called one of the planet’s worst environmental disasters. Its sad story began about 50 years ago when Soviet planners decided to tap the two rivers that fed the sea and build canals that would help them to irrigate new cotton fields in Turkmenistan and Uzbekistan. The overall history is horrific. The sea’s thriving fishing industry died, tens of thousands of jobs were lost, the region’s climate has changed and staggering amounts of water are still wasted through poor conservation. The two main fishing ports, Aralsk in Kazakhstan and Moynak in Uzbekistan, have been left high—and very dry—since the 1980s. Much has been written about the sea’s demise, and I hope you’ll check out some details. But we took a trip from Khiva to Moynak and surrounds (staying overnight), and I thought some poignant photos might bring home the tragedy. In the 1960s, Moynak was a thriving port. Today, nine rusted-out ghost ships lie mired in the hot sand. Some face Moynak and others point longingly towards the shore that is now 140 kilometres away. Locals say that if every scientist who came to review the problem had brought a bucket of water instead, the sea might still lap at the shores of Moynak. It might help too if the lavish fountains of Turkmenistan were turned off and the citizens of Uzbekistan were obliged to pay for the water they use. It’s scary and gobsmacking. And yes, Las Vegas is running Lake Mead dry. That’s on my to do list of places to visit. Amazing how we can alter the planet so quickly, within our own lifetime. Hope you make it Brad. Some of our group went on to the actual shore and camped there. It was another five hours of driving. A sad history, but a really cool post Peggy! Very sad, Mike. I never thought that in my lifetime I would see the Aral Sea. I still haven’t seen it, but I’ve stood where it was. I used to teach this to my year ten classes.They saw the photos, they saw the satellite shots but it is an unreality that 14 and 15 year olds cannot comprehend. One thing we learn from History is that we never learn from History. It’s amazing (and more than a little terrifying) how little notice we take of what happens before and around us. Gosh, this is such a sad story! 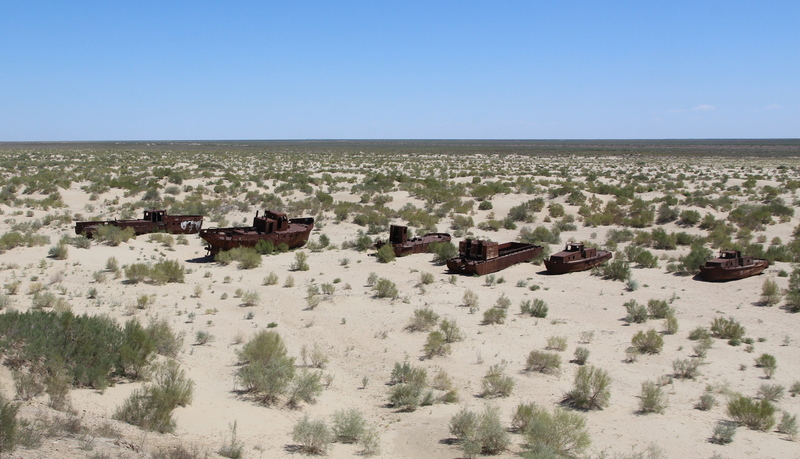 Perhaps one day the Aral Sea can be revived! Thanks for sharing! It’s hard to know whether it could be brought back, but I’m sure things could be improved. I guess time will tell us. This is a post from one of my very top blog supporters. If you want a personal tour of the whole world go to her blog it is really quite amazing. If the question is, “Is progress worth it this must definitely come in on the side of,”Please can we go back to the good old days. I want to thank Peggy for letting me use this it is so very powerful. Thanks so much for re-blogging this. It’s a message the world needs to hear. You are so right. Such tragedies are being played out the world over. If only there was an efficient way to teach people how to nurture their future. Truly a horrible story of how we humans take Mother Nature for granted. And then when she fights back with hurricanes, earthquakes, fires, and anything else that takes human lives, we get mad. She is only trying to protect herself. Thanks! Such a pity that we make it so hard for Mother Nature to do her job. Never heard of the Aral Sea…. interesting post and too bad it had a negative environmental impact on the region. I forwarded this URL to my Russian/Uzbek/American friends. Thanks for sharing the URL. It’s a story that needs to be more widely known. I can’t even find the words to comment Peggy-what a disaster! I read the Wikepedia stuff too, the photos made me want to cry! Me too, Jan, me too! Wow, I didn’t have any idea about the existence of such a sea until I read this post. It’s fascinating yet sad. Thanks for posting! I hope the future brings some positive changes to the sea. This is heartbreaking. When will man learn to stop imagining he knows better than nature – about as soon as he stops being greedy I guess. ‘The Lorax’ really should be compulsory reading for all of man(un)kind. You are absolutely right, Osyth—about the greed and the need to read The Lorax. I think your photos bring home this ugly truth even more than the last post I read on this sad subject. Such an awful picture of what man has done to our planet. You can’t help but wonder—how can people do this to their offspring? Fancy, schmancy boats on Olkhon Island | Where to next?